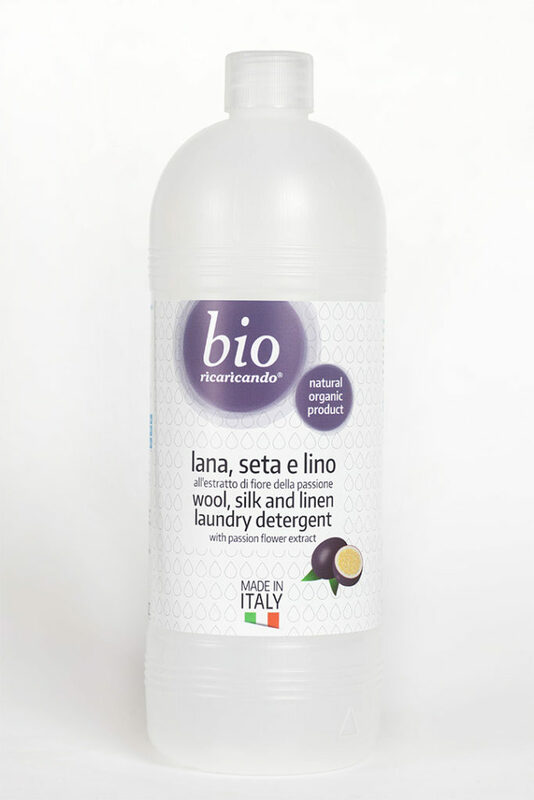 Detergent for delicate garments for hand or machine washes. Recommended for baby clothes. It makes fibres soft with its vegetable glycerine. AQUA, COCOGLUCOSIDE, SODIUM COCO-SULFATE, ALCOHOL, SODIUM CHLORIDE, LAVANDULA HYBRIDA OIL* (ORGANIC LAVENDER ESSENTIAL OIL), LINALOOL. By hand: 60 ml of detergent for every 5 l of water. Machine washing: see table* of doses for standard load of 2.5 kg dry fabric. It is advisable to pre-treat the toughest stains with Ricaricando’s biological stain remover.